In 1977, ESA placed the first technological study contract in the field of space laser communications. Today - with two independent companies developing laser communication terminals - Europe is in a leading position in the domain of optical communications. The most visible result of ESA's optical communication efforts will be SILEX, the world's first intersatellite laser communication experiment. SILEX consists of two terminals, one onboard France's Spot-4 Earth-observation satellite and the second onboard ESA's Artemis geostationary telecommunication satellite. 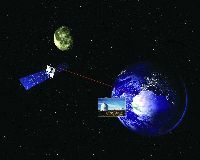 Spot-4 was launched in 1998; Artemis was launched in 2001. As part of the SILEX programme, ESA has also constructed an Optical Ground Station (OGS) on the Canary Islands. The OGS was used for commissioning and routine checkout, of the Artemis satellite and can simultaneously receive and transmit data. Whereas SILEX has demonstrated optical communication between Earth and Artemis in its fixed position at 36 000 km, the SMART-1 Laser-Link Experiment will allow the study of the effects of the laser beam passing through different air masses and with the target spacecraft at varying distances from Earth. An optical communication link, in which a laser beam is used to convey signals, is much more direct than a radio frequency link and can thus cover greater distances. The use of very high frequencies (laser) also permits a very wide bandwidth, meaning that a greater amount of information can be transmitted in less time as compared to a radio signal. (The interest in higher frequencies is also to be seen in SMART-1's KaTE experiment). While the influence of the atmosphere on optical beams from space to ground can be routinely monitored by observing stars, its influence on optical beams from ground to space can only be evaluated theoretically. It is well known that the atmosphere's influence on laser beam propagation is very different for the two cases. This difference in behaviour is also called 'shower curtain effect' and it can indeed be observed by looking through a transparent shower curtain while taking a shower. The view from the inside out (from behind the shower curtain) is very much blurred, while the view from the outside in (from some metres away from the shower curtain) is comparatively clear. The SMART-1 laser-link experiment is ideally suited to monitor those effects of the atmosphere on a laser beam from ground to space and in different conditions (for example varying distances, heights above horizon). The Earth's atmosphere is not benign when optical communications are concerned. Absorption by water vapour can reduce the energy content in the communication beam and turbulence can increase the beam's divergence. A laser beam generally propagates in a straight line, but atmospheric turbulence can deviate its path. The laser beam's coherence (the way its electromagnetic waves are phased with one another) can also be altered by atmospheric turbulence. ESA's Optical Ground Station (OGS) is located at the Observatorio del Teide at Tenerife, situated at an altitude of 2393 m, well above the first inversion layer or cloud level. The site offers optimal conditions for Earth to space optical communications links. The station consists of a one metre Ritchey-Chretien/Coudi telescope in a domed observatory building with all the associated control systems. The OGS transmitter uses a Ti:Sapphire laser pumped by a 28 Watt Argon laser. In order to generate 28 Watts of optical power the Argon laser consumes 60 kilowatts (!) of electrical power. This energy is partly used to heat the OGS, but most of it is dissipated by radiators outside the OGS. The wavelength of the Ti:Sapphire can be automatically set between 750 nm and 900 nm. For the SMART-1 experiment it will be tuned to 847 nm, the same wavelength as used in the SILEX experiment. The laser's output power is some six watts. A new laser transmission technique will be used by producing four incoherent sub-aperture beams, affected differently as they pass through the atmosphere, but whose net result will be a more consistent signal received by the target. The laser-link experiment will be performed by pointing the spacecraft's AMIE camera towards the Earth. Apart from a laser line filter which covers a section of the CCD imaging array of the camera, there is no specific laser-link equipment aboard SMART-1. Using the spacecraft's orbital coordinates or ephemeris with respect to stellar background (as seen in the field of view of the OGS telescope), the Tenerife station will aim the laser beam at the spacecraft. The laser will be just a pure carrier and it is not intended to transmit any actual information. The pointing accuracy required is <10 microradians, equivalent to shooting at a 1.5 cm diameter coin from a distance of 1500 metres. The laser-link demonstration is being conducted by ESA's Directorate of Technical Operations Support at ESTEC and the experiment's technology investigator is Zoran Sodnik.